1 inch, 2 inch, 3 inch, 4 inch and 6 inch x 30 foot rolls of Prismatic Oralite (formerly Reflexite) V92 Tape. Comparable to crystal or diamond grade tape in brightness. This is a commercial quality reflective material with a reflectivity rating of around 500 candelas depending on the color. White is the brightest. Prismatic tape provides the brightest reflectivity available and reflects at greater angles than standard reflective tape. We currently carry white, school bus yellow, red, green, blue and orange. Oralite (Reflexite) V92 prismatic reflective tape was developed for emergency vehicle graphics but is also used to mark loading dock areas, bollards, poles, gates, barricades, tractor trailers, emergency vehicles, etc... Prismatic reflective material is normally found on brighter road signs, tractor trailer rigs, bollards and schoolbuses. 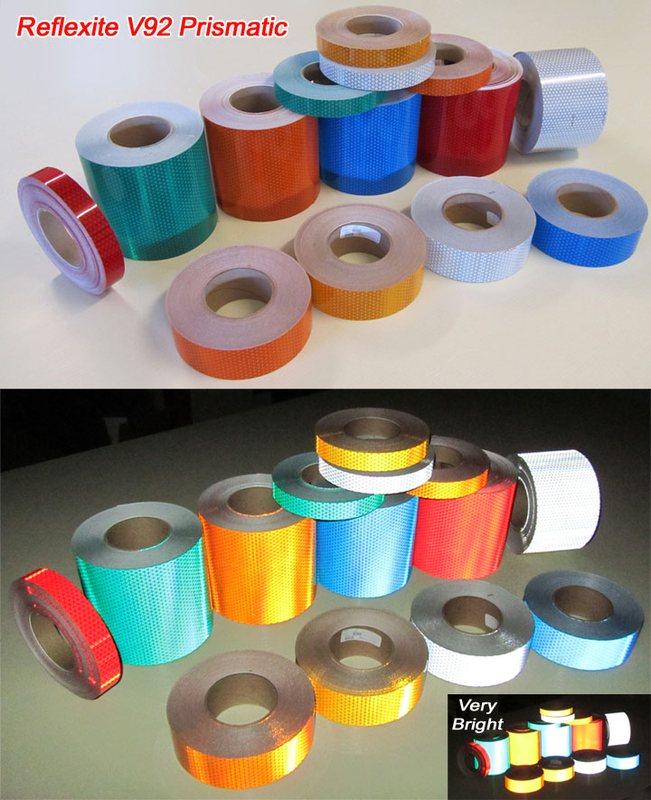 Oralite (Reflexite) V92 tape is 7 times brighter than standard engineer grade tape. Light is reflected via micro prisms making the tape much brighter than glass bead type tapes. It carries a 5-7 year outdoor rating. It is easy to handle and resists chipping and cracking. To install simply peel the backing off the tape and apply to a clean surface. Press on with a clean cloth or squeegee. Reflexite invented prismatic reflective tapes and makes them in a single layer thus eliminating problems that arise from delamination. Oralite (Reflexite) tapes DO NOT come apart like other brands. All widths available in white, school bus yellow, red, green, blue and orange.